2010 Topps Gold #425 Dez Bryant Rookie Card Dallas Cowboys - Only 2,010 made! Serial numbered 2004/2010. Near Mint to Mint condition. Card shown is the actual card you will receive. (01)-061 Dez Bryant. (06)-061 Dez Bryant Blue Wave. (03)-080 Tony Romo. (08)-080 Tony Romo Blue Wave. These contain all base and rookie cards for the team listed (1-150) as well as the parallel blue wave cards (1-100). (04)-048 Dez Bryant. (08)-274 Tony Romo. These contain all base & rookie cards for the team listed (1-440). Cards average NrMint condition - Included players listed below (02)-013 Sean Lee. (07)-271 Cowboys Team Card. ANY GLARE OR SCRATCHES ARE FROM SCAN NOT A CARD ISSUE ! (09)-009 Demaryius Thomas. (06)-006 Dez Bryant. 2010 Score Select "ROOKIE" Football Insert Set. Cards average NrMint condition - Included players listed below - We always provide exact players & card numbers to eliminate any doubt. DEZ BRYANT. 2017 PANINI CONTENDERS OPTIC. SEASON TICKET. (02)-069 Dez Bryant. (09)-410 Tony Romo. These contain all base & rookie cards for the team listed (1-440). Cards average NrMint condition - Included players listed below (01)-031 Sean Lee. (08)-403 Dallas Cowboy. 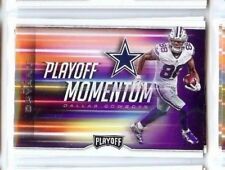 2016 Panini Classics Dez Bryant SP!! #98 (Cowboys) Hot!! Look!!! DON'T MISS OUT ON THIS TOUGH CARD! (01)-016 Dez Bryant. (02)-044 Tony Romo. These contain all base and rookie cards for the team listed (1-200). Cards average NrMint condition - Included players listed below - We always provide exact players & card numbers to eliminate any doubt. 2014 Topps Dez Bryant Power Players!! (Cowboys) #PP-2 Look!!! Hot!!! Jason Witten, Tony Romo, Dez Bryant ROOKIE. The card #'s are- 11, 18, 52, 62, 77, 107, 126, 200, 305, 316, 368, 407, 419, 425, & 435. The set is in NM to NM/MT to MINT condition. Dallas Cowboys Card! Dallas Cowboys. Oklahoma State Cowboys. 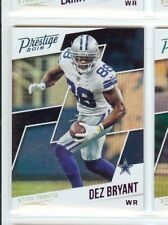 2018 Panini Donruss Elite Dez Bryant. Dual Threats. Red Parallel. 2017 Majestic Dez Bryant Jersey # 88/99. Condition is Like New. Shipped with USPS First Class Package.